It's time now to start your DIY Valentine's Day projects and I've gathered some of my Internet favorites for you. Valentine's Day used to be my favorite holiday; hearts, my favorite shape. I used to make cards smothered in Victorian lace, glittered hearts and gooey love cliche's. But this year, I'll let you do the work. Let me stress: Homemade cookie dough. Don't give away store stuff. Some of us are famous for our cookies, so why not give away the dough all mixed up in advance? I Heart Naptime has great instructions and a free downloadable gift tag to go with the cookies. 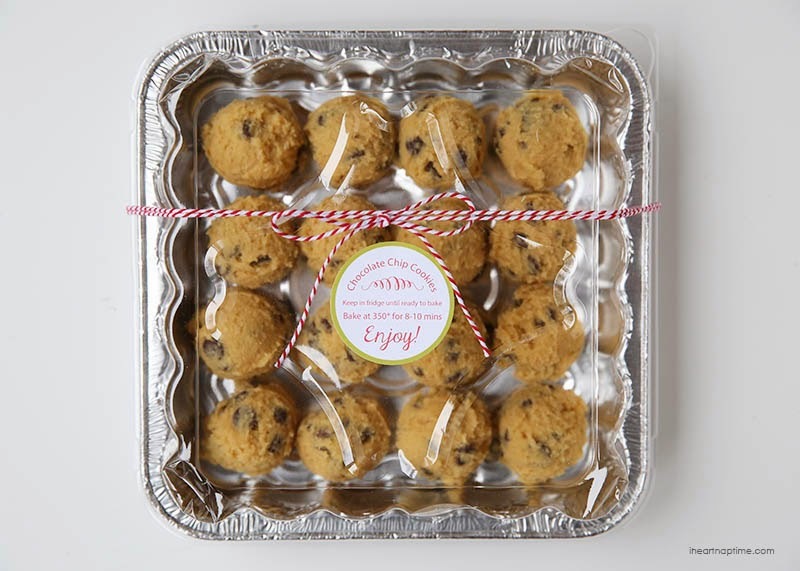 Cookie Dough Gift Idea. #2. 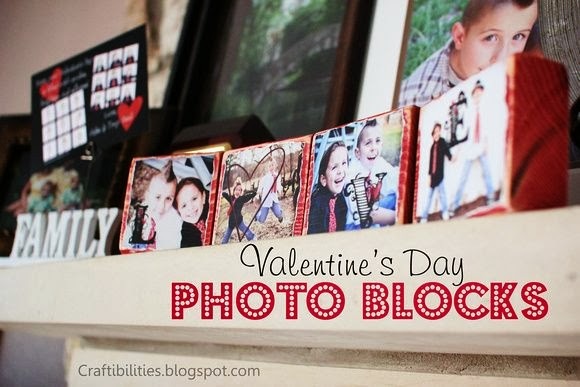 Valentine's Day Distressed Photo Blocks. This really is my #1 favorite, but because of the time, supplies and skill level involved in making these, I bumped it to #2. I love photos, wood and anything distressed, so these really caught my eye. If you like art, scrapbooking or modpodge, this one's for you. #3. Free Assorted Valentine's Day Printables. Several different Valentine's Tags for gift ideas. 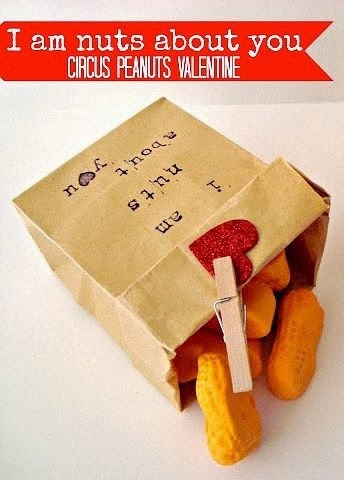 My favorite is the paper lunch bag with the printable seal and a clothespin at the top. 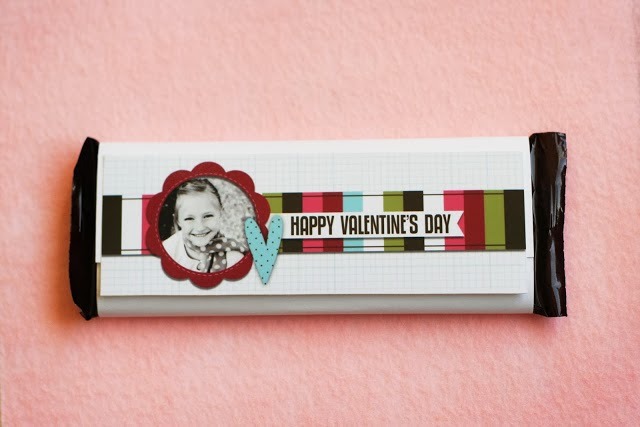 You can alter the clothespin with scrapbooking supplies, too, for a little extra fun. #4. Personalized Candy Bar Wrappers. Of course, I want a Hershey bar in this, but you can fit it to other candy bars. This one, too, could be my #1 favorite. #5. Personalized Water Bottles. Too much sugar? 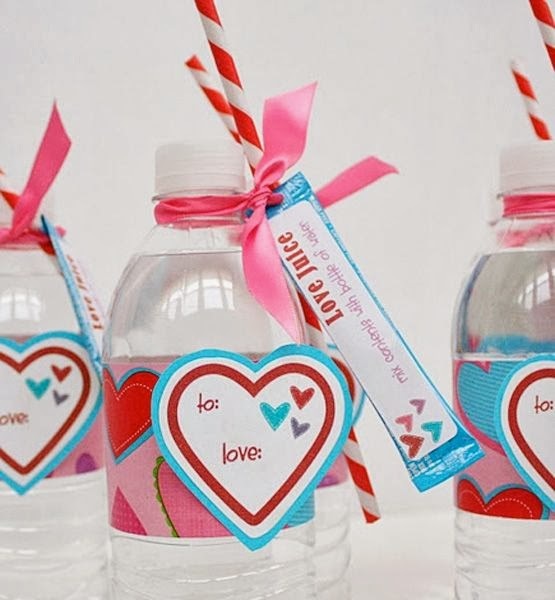 Hand out cute, decorated water bottles. Everybody's going to be thirsty after all their candy binges. #6. 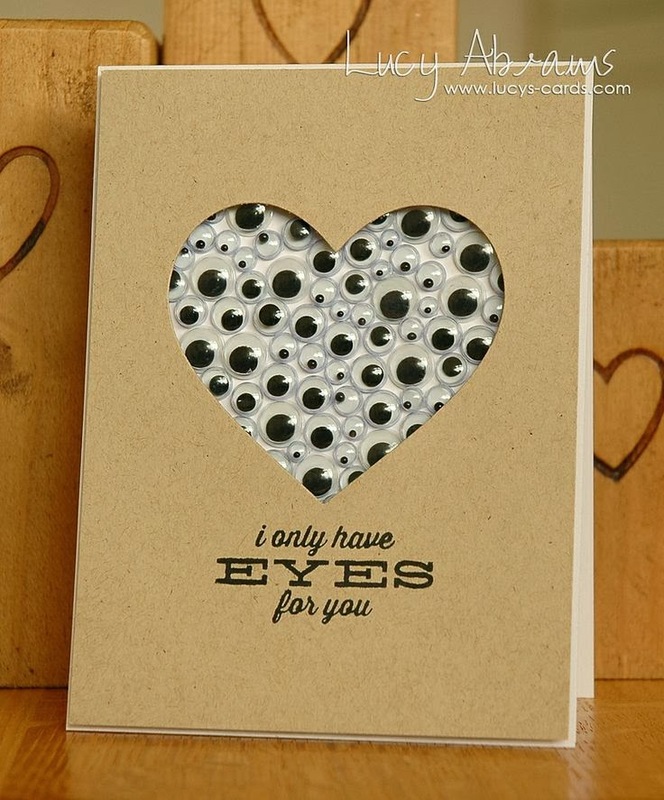 I Only Have Eyes For You Card/Notebook. This one has directions to be made as a card. But I suggest you use a plain notebook and make this a journal for someone. You can get plain cardboard journals at a craft store and even some Walmarts or Targets now. If you want to splurge on someone, get a Moleskine and alter it with the fabulous eyeballs. #7. Toilet Paper Tube Owls. 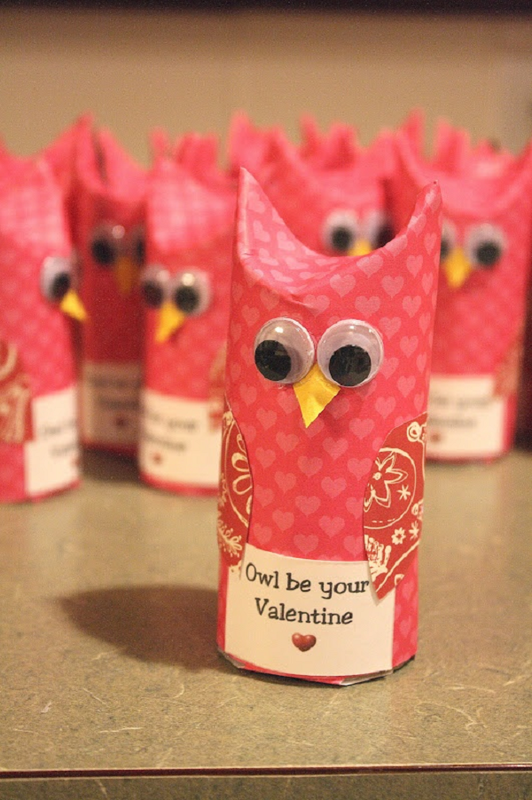 If you are a teacher, this looks like a great craft for the class. There was one suggestion that a bag of candy can be tucked inside the tubes to make it a gift idea. #8. 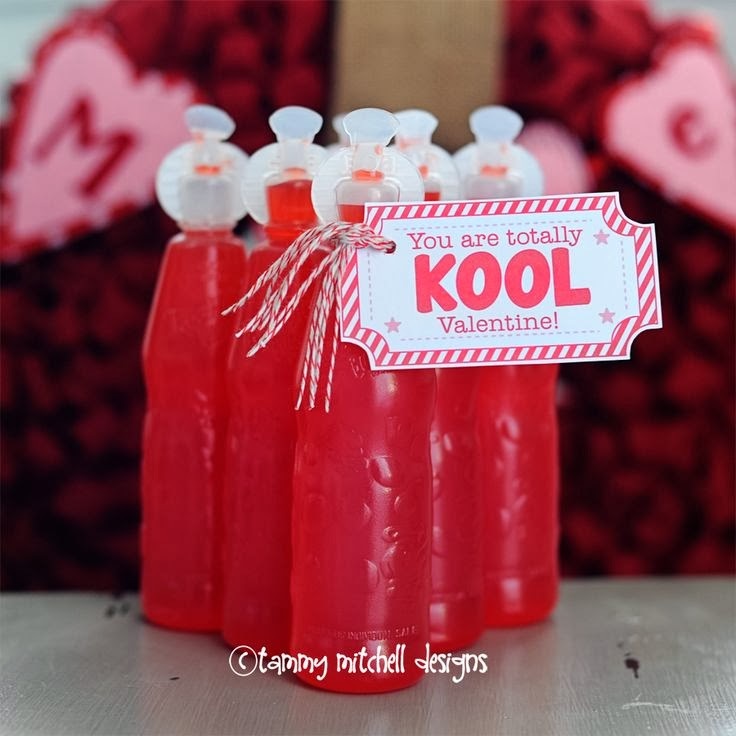 Kool-Aid Free Printable Valentine's Tags. "You are totally KOOL, Valentine." This is super cheap, super easy and all kids love Kool-Aid. #9. Nuts About You ~ Gift of Gourmet Nuts. OK, so you can cut costs and use plain peanuts, but I think this gift idea would be nice with gourmet flavored nuts like praline pecans or Cajun peanuts, etc. #10. Love.... In Any Language. My son-in-law did this one. Write "I love you" in different languages on hearts and paste them all over your sweetie's house. All. Over. #11. 20 Perfect Valentine's Day Desserts. A bunch of foodie ideas all in one place! That, my friend, is my Valentine to you.